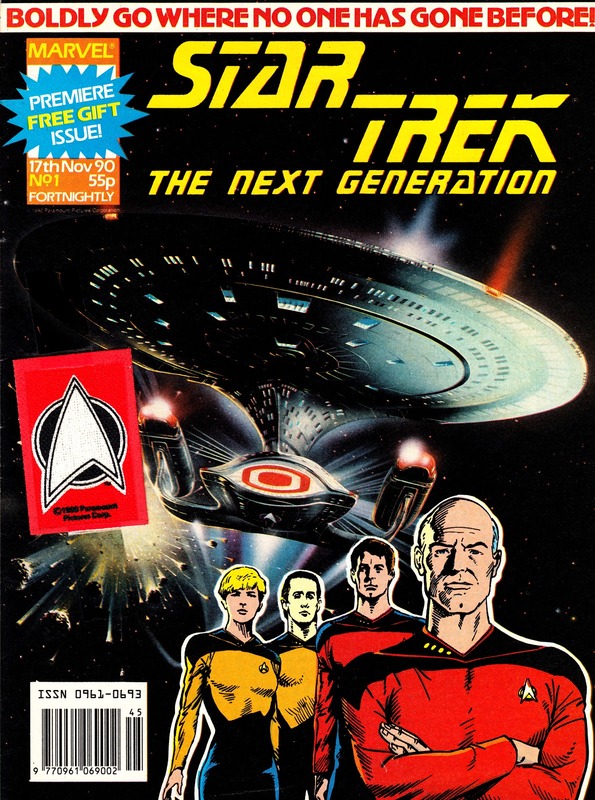 This is the first issue of Marvel UK's licensed STAR TREK: THE NEXT GENERATION comic, launched in November 1990 to roughly coincide with the show's first airing on British TV (shared out between the BBC and B-SKY-B). 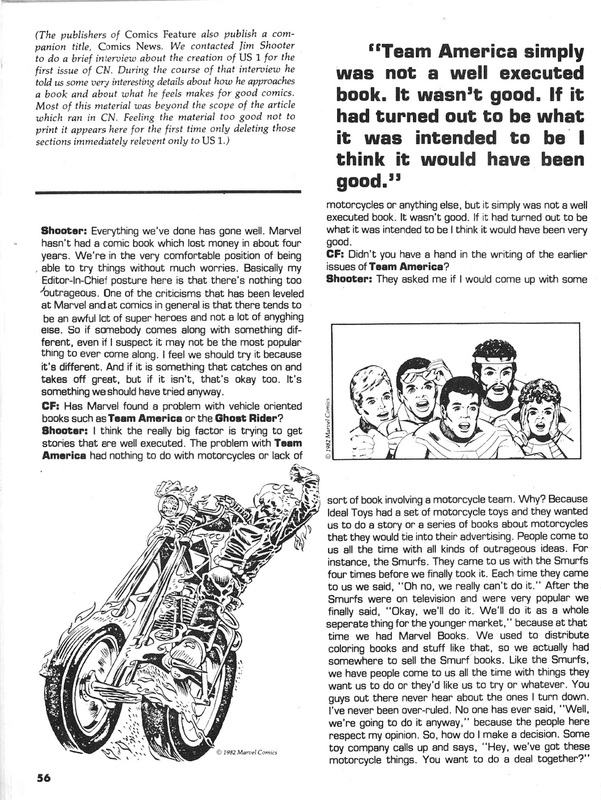 It's notably for being almost entirely assembled from material originally produced by Marvel's rival US publishers. The bulk of each issue consisted of reprints from DC Comics' ST:TNG comic book (beginning with their original six-issue mini-series, produced and published during the show's first season and, initially at least, slightly unsure of the tone of the characters and the show*), padded out with articles lifted from Starlog Group's OFFICIAL STAR TREK: THE NEXT GENERATION MAGAZINE. 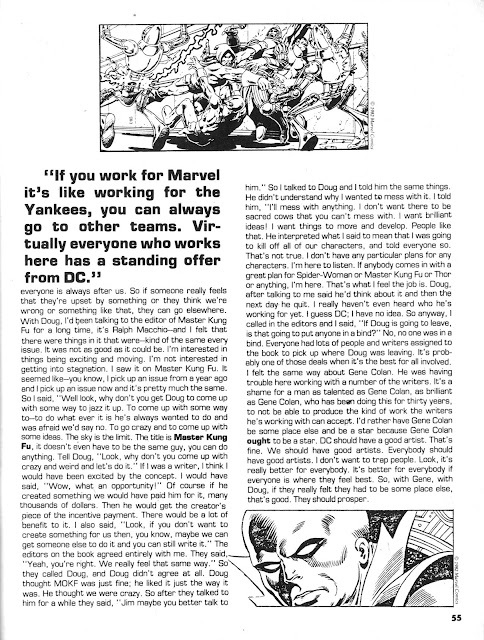 Unfortunately, Marvel made no effort to hide the origins of the later, simply rerunning the original US text pages and photos. 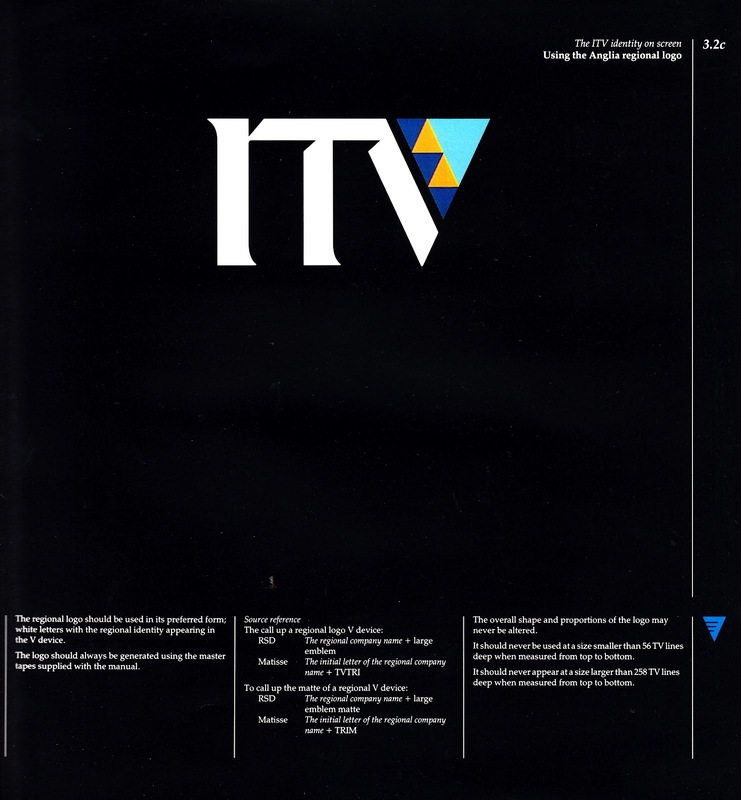 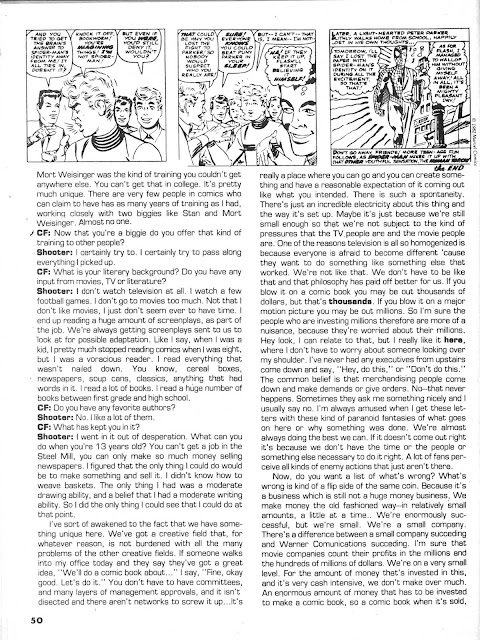 Neither the comics nor the magazine had enjoyed mainstream distribution in the UK although both were readily available from specialist retailers and ST:TNG fans, desperate for any fix they could get prior to the show hitting British screens (CIC were releasing episodes for home video although initially only as too-expensive-to-buy rental tapes), were already buying them. TNG was, in many ways, the quintessential Marvel UK publication (albeit assembled from non-Marvel material): hastily assembled with the minimum of origination and creativity. 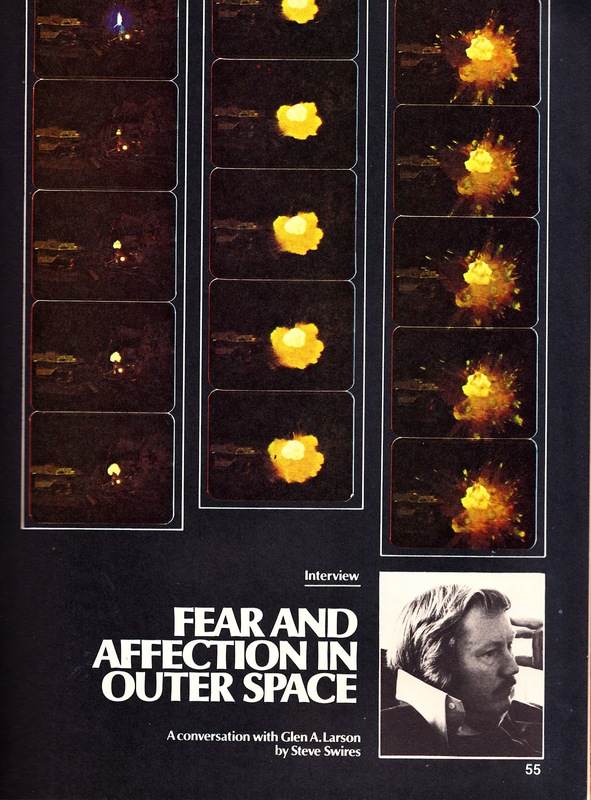 Fans hoping for something along the lines of DOCTOR WHO MAGAZINE were very disappointed. 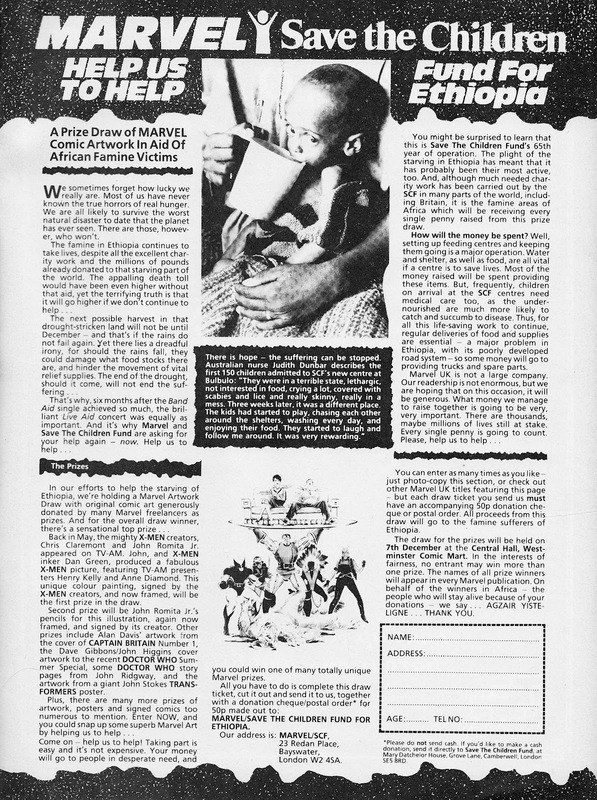 Origination was limited to the covers and some editorial pages. 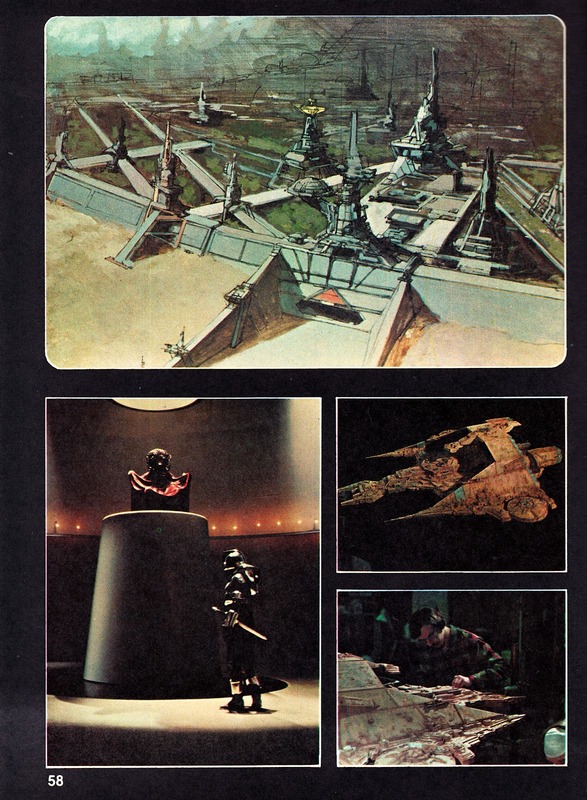 The former were mostly crudely assembled from TNG's (frequently dull) publicity shots (which often also adorned Starlog's magazine) and actual panels from the DC comic strip. 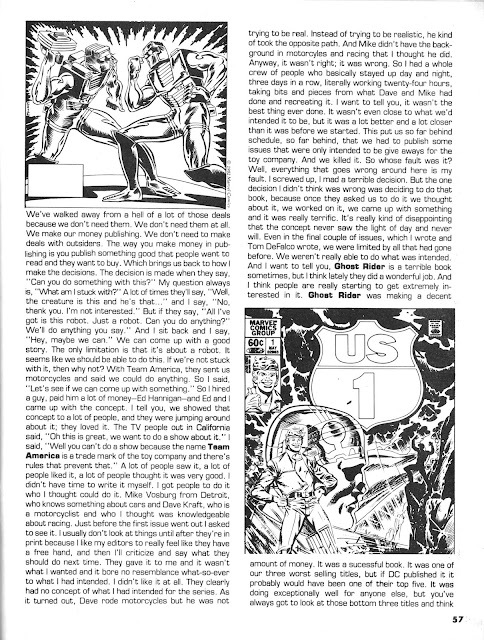 None of the DC covers were reused, suggesting that either M-UK felt them unsuitable or an extra payment was involved. The originated editorial pages were restricted to an editorial for each issue and a new letters page. The whole thing had the feel of a comic hastily assembled by someone on work experience just before deadline. 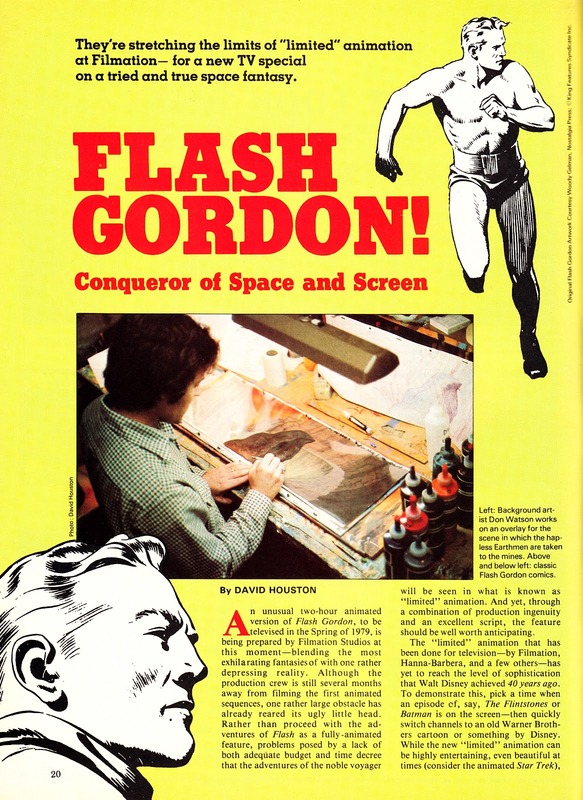 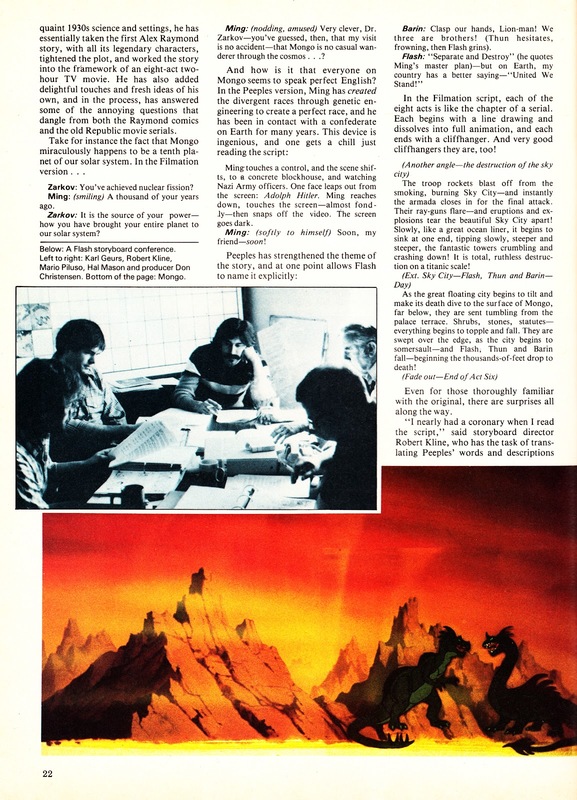 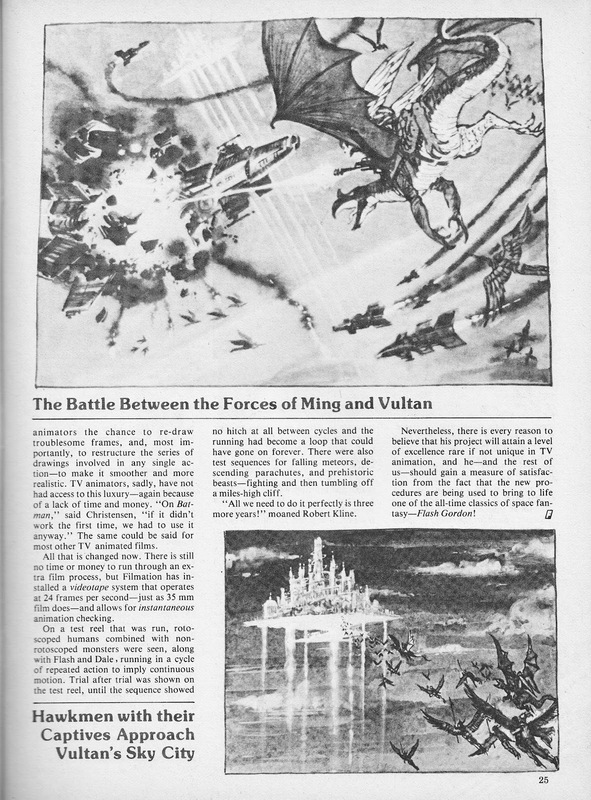 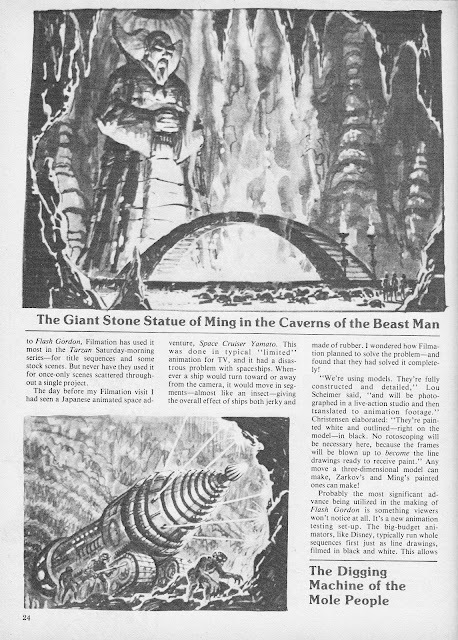 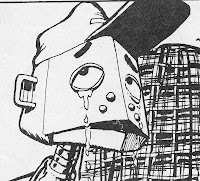 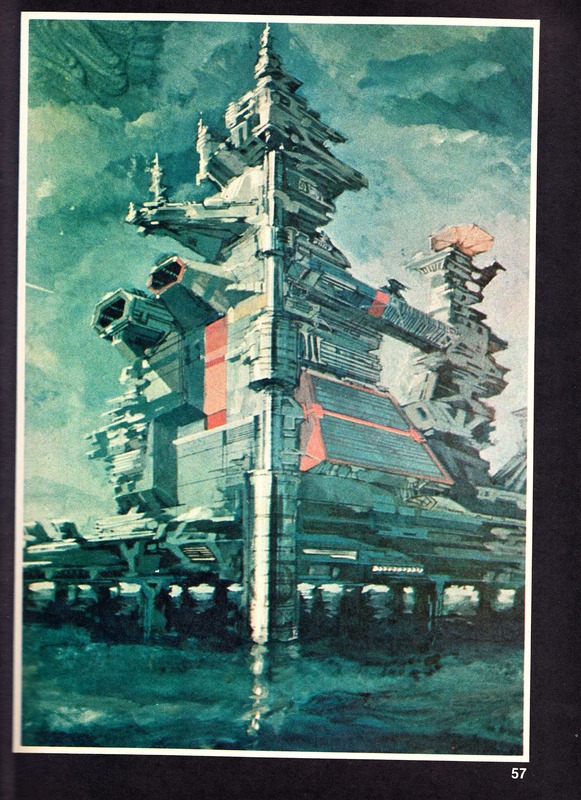 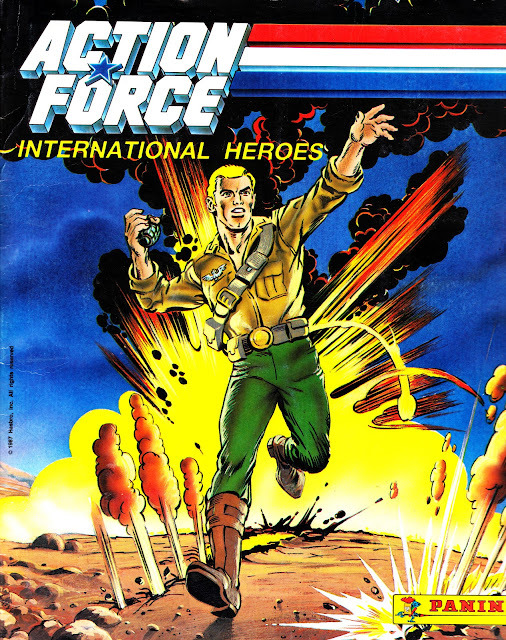 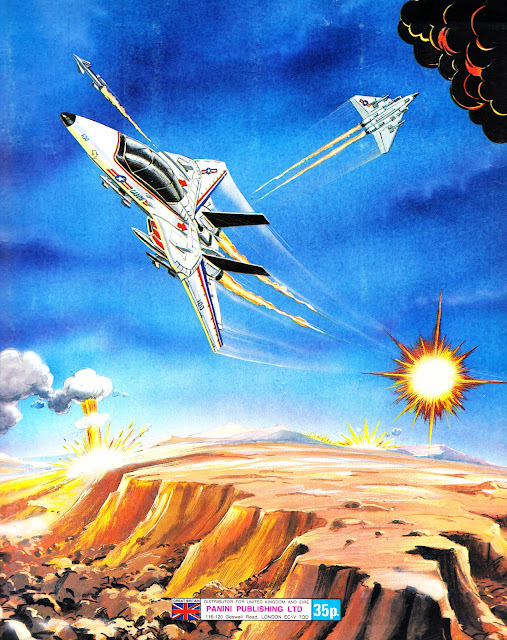 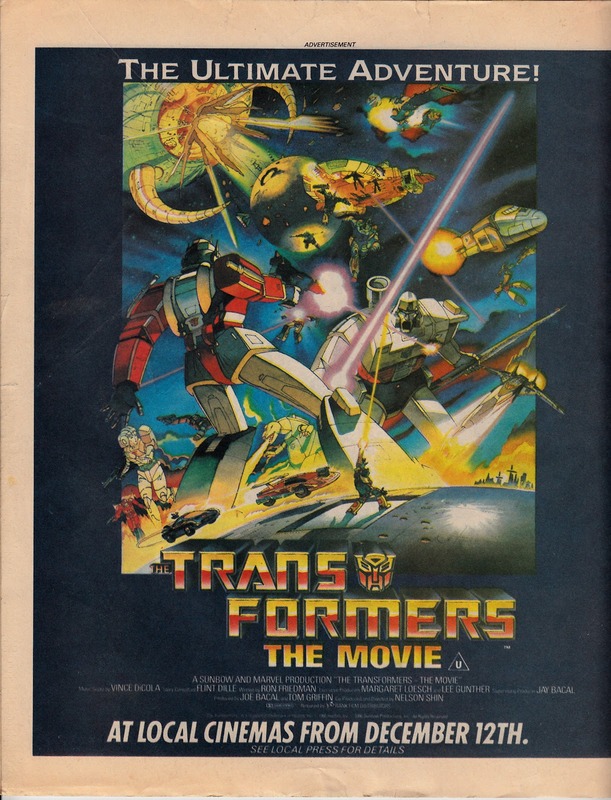 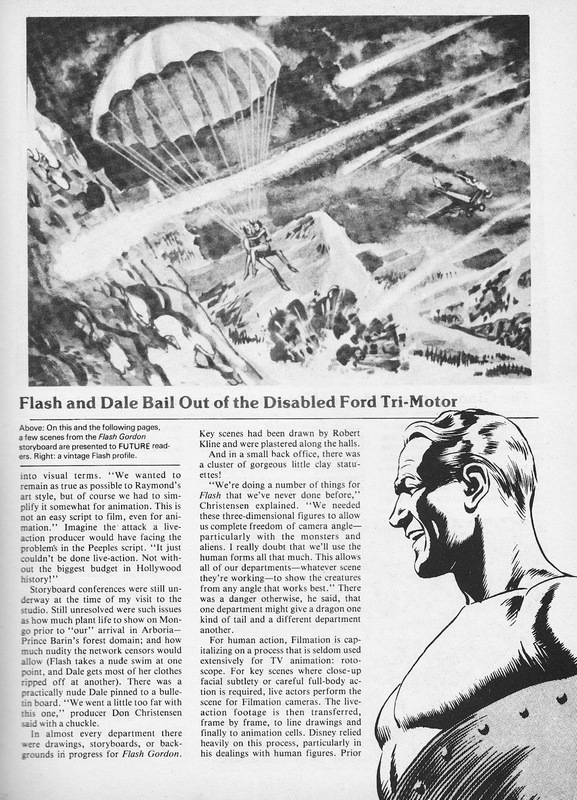 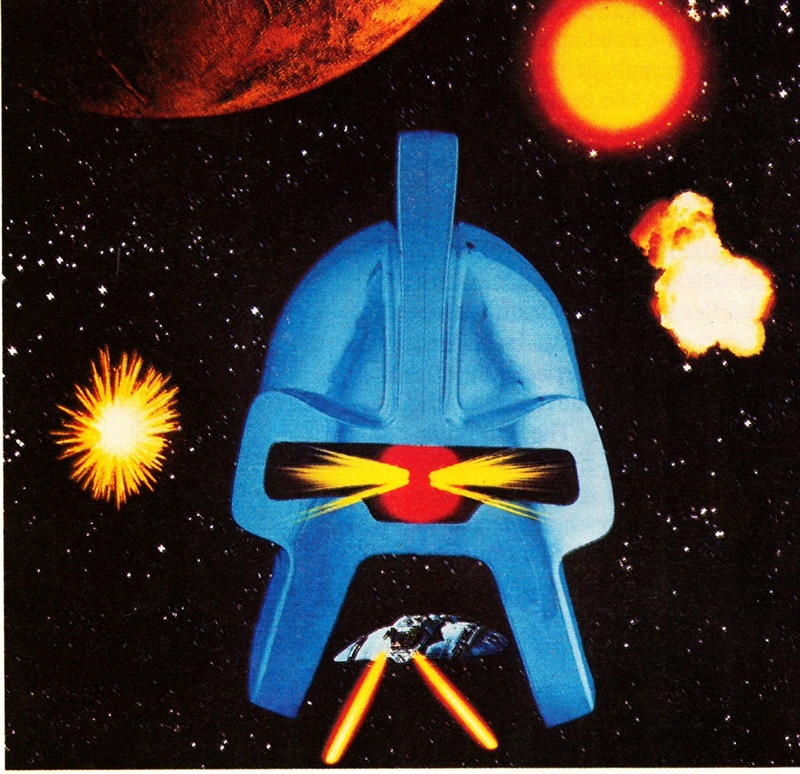 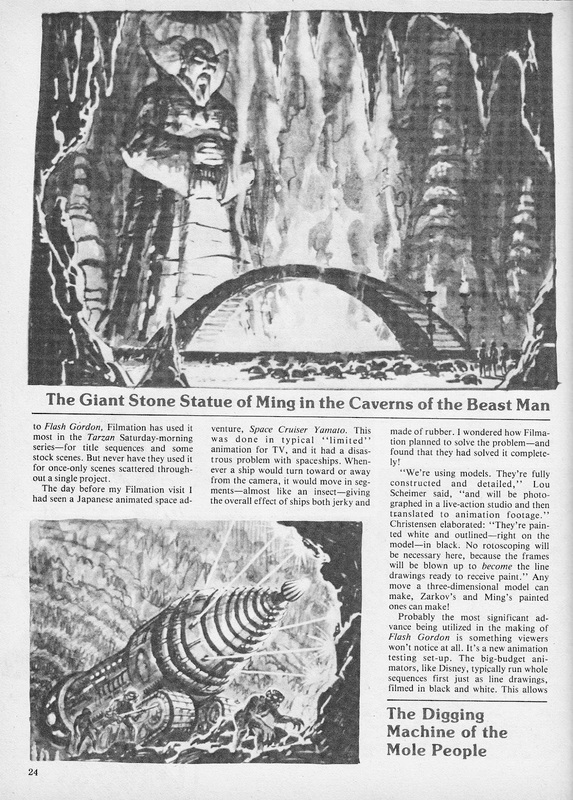 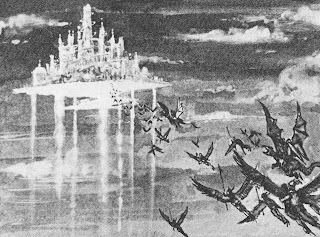 The cover of the first issue was a fairly crude montage of background art created by Paramount for publicity purposes with art (by Pablo Marcos) from the comic strip slapped over the top. 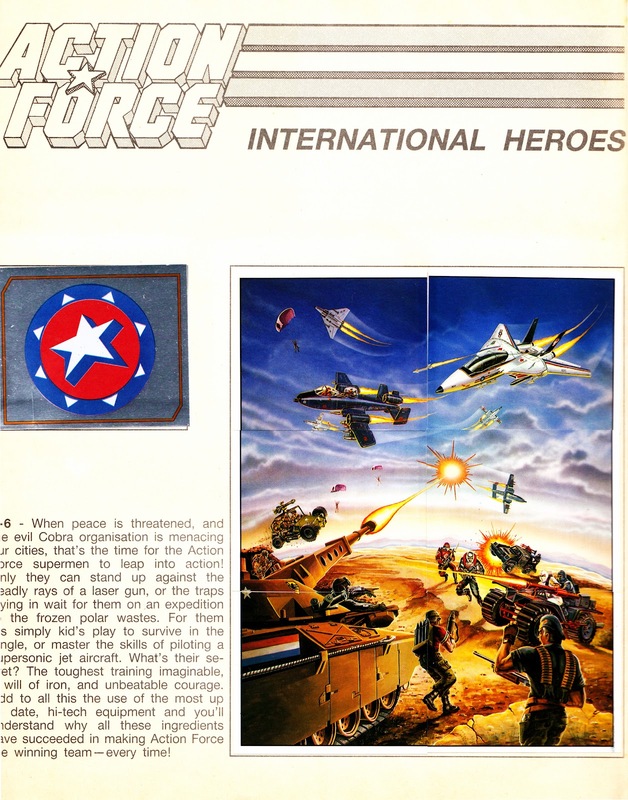 The free gift was a fabric patch of the sort you might attach to your swimming trunks (if you are seven). 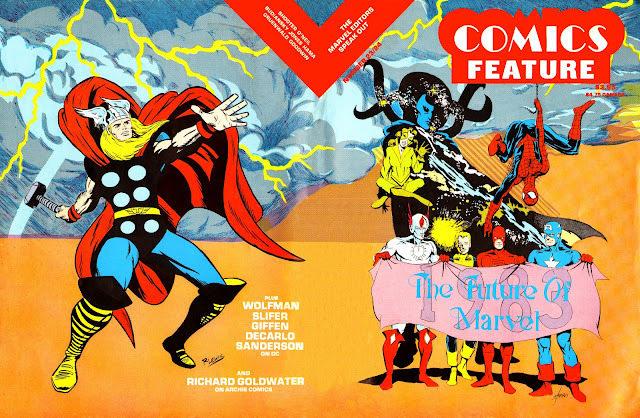 Marvel obviously realised they'd boobed (probably when the sales figures came in) and belatedly relaunched it (with an increased page count, better design and a new logo) as a monthly with issue 20. 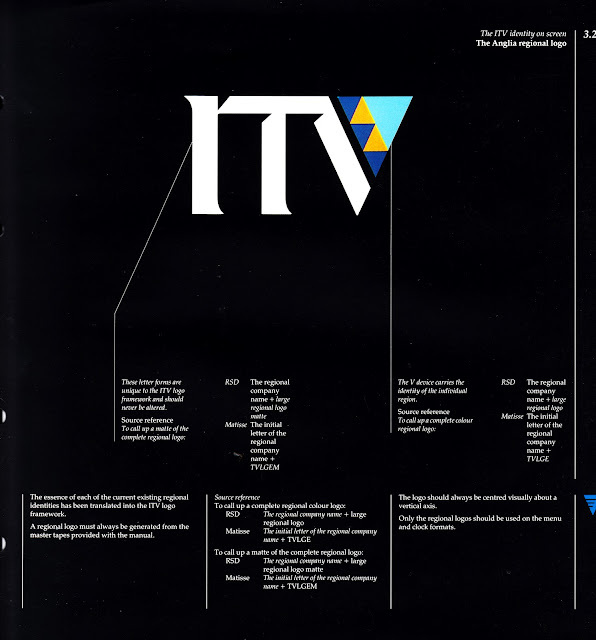 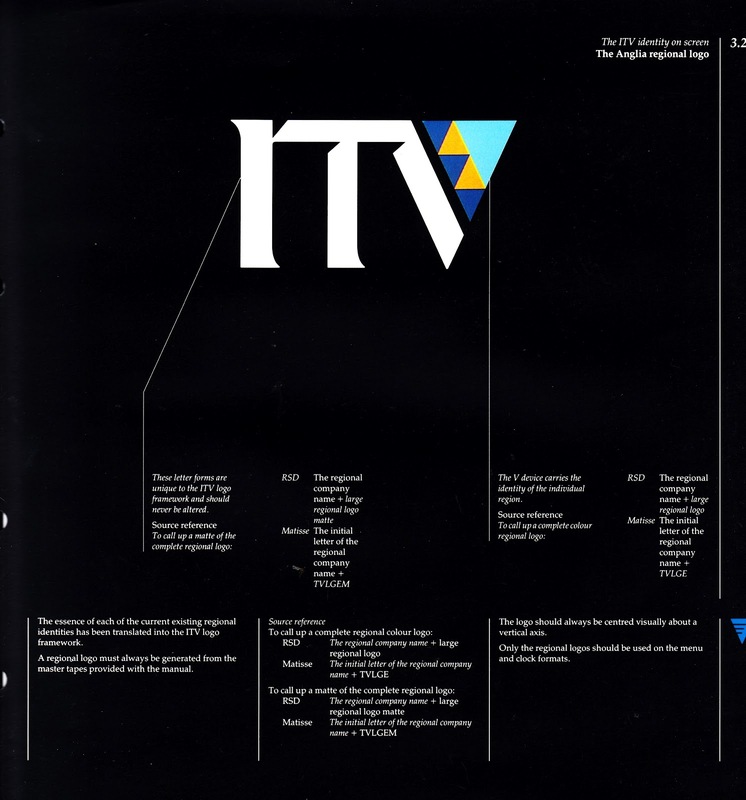 The origination budget was also jacked-up and new UK editorial added to increase the title's appeal to more discerning British fans. 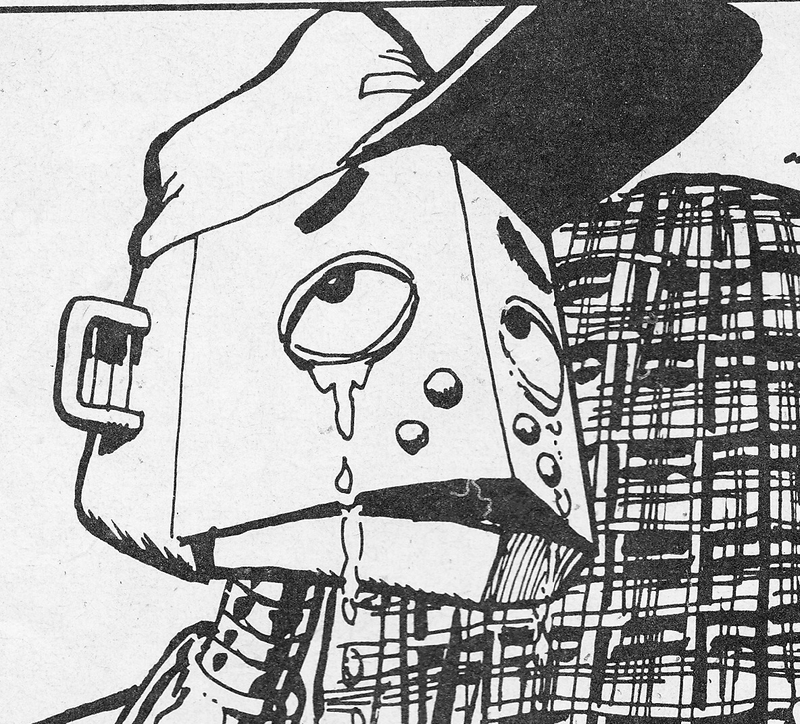 However, it was too little, too late and the 24th issue (dated 4 January 1992) was the last. Unlike many of their publications from this era, the TNG magazine did have an official last issue but didn't merge with another title. 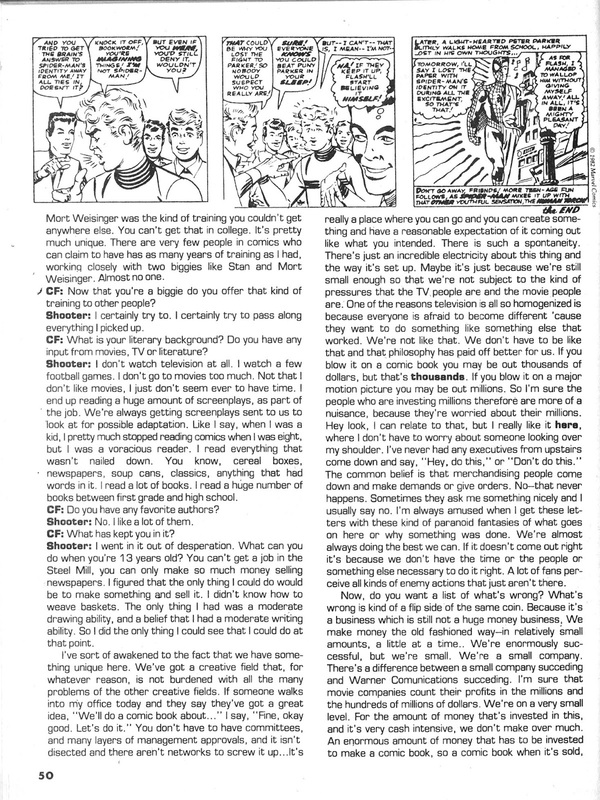 Marvel also published an ST:TNG ANNUAL for Christmas 1991 which followed the exact formula of the fortnightly, making it appear particularly poor value. 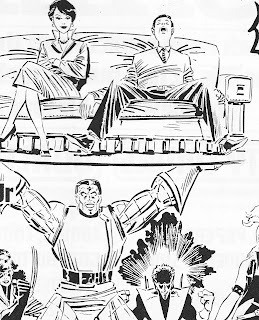 This wasn't, of course, Marvel UK's first voyage in the Trekverse: they'd published two standalone STAR TREK holiday specials in the early 1980s as well as serialised Marvel's Trek strips in the pages of FUTURE TENSE. 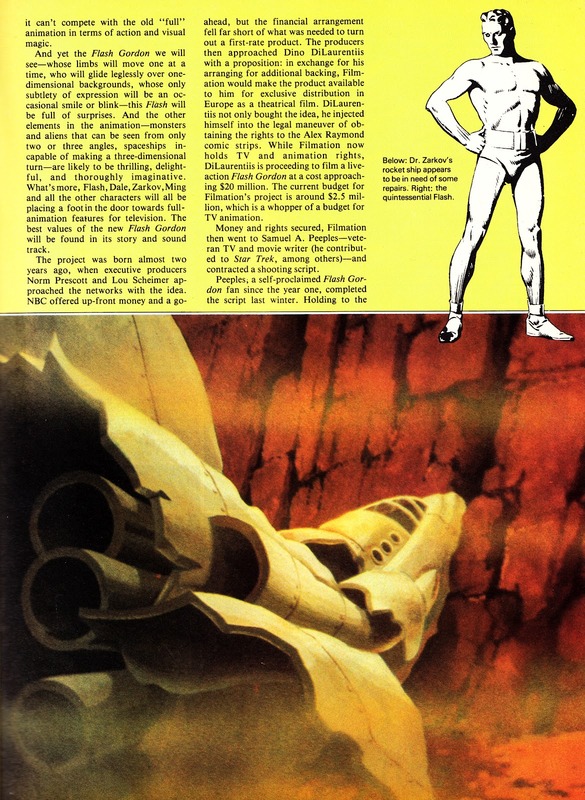 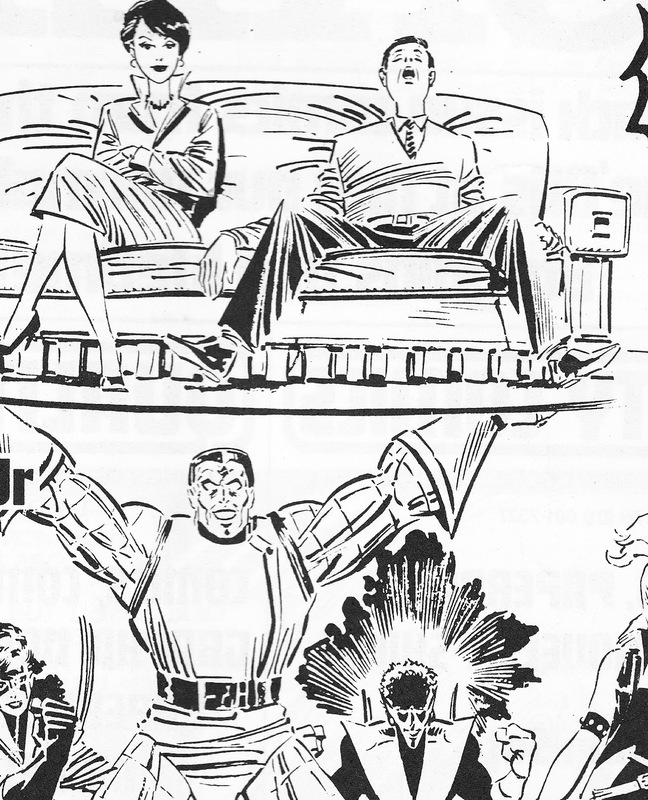 Marvel's adaptation of STAR TREK: THE MOTION PICTURE had also appeared as an annual by Marvel/ Grandreams. 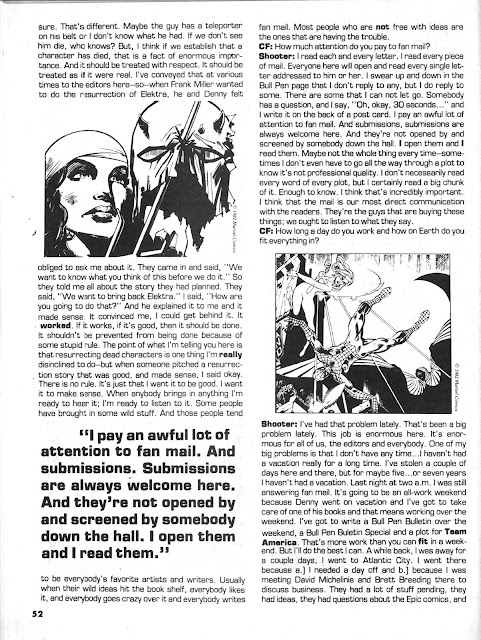 * DC themselves placed this initial adventure, produced (for deadline reasons) just as the show was starting to shoot, between the pilot Encounter at Farpoint and The Naked Now, the show's first two outings. 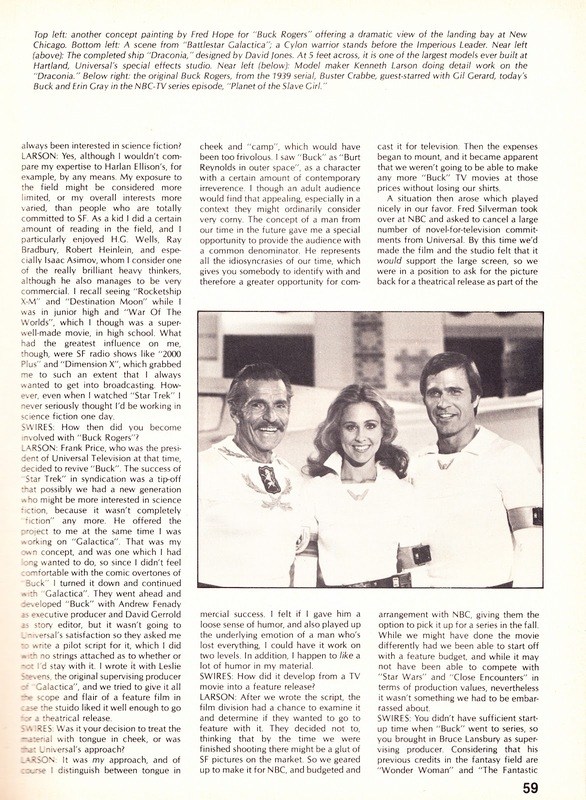 In the late seventies, pester-power extended to where your parents filled-up the car. 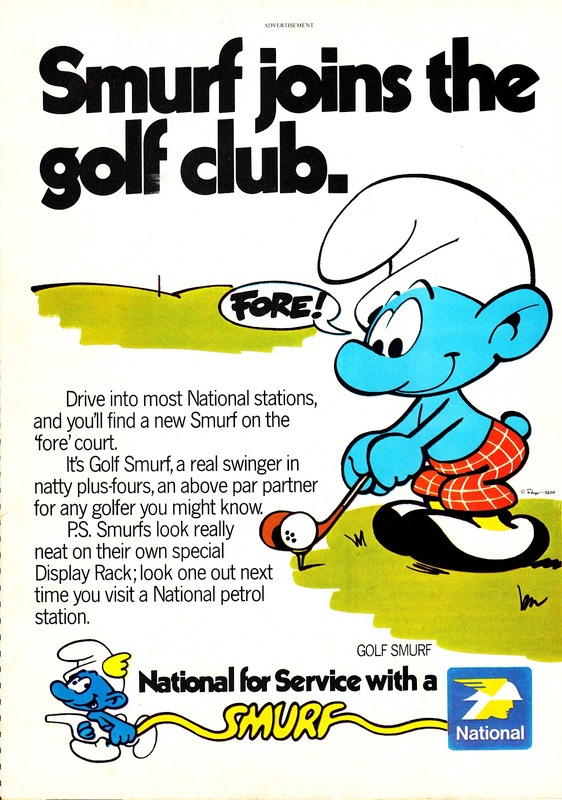 Whilst purveyors of petrol tried to lure in the punters with glasses and other trappings of the suburban highlife, the (now defunct) chain of NATIONAL STATIONS formed an alliance with THE SMURFS. 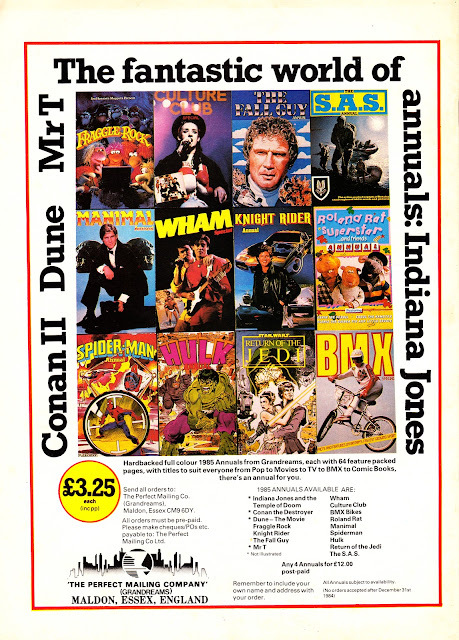 Britain's kids instantly reassessed which chain of garages were the best. This is an advert, from LOOK-IN (October 1979), promoting the latest addition to the range: Golf Smurf (presumably one for the middle class dads as well). 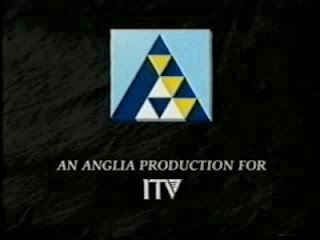 ITV's LOOK-IN had already realised the benefits of prominently featuring the little blue goons. 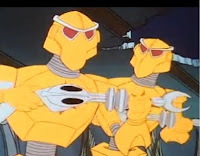 It's worth remembering that we're still years away from NBC stumbling across Les Schtroumpfs and, with Hanna-Barbera, launching them to Saturday morning glory (in 1981). The National chain seemed to quietly vanish in the 1980s. 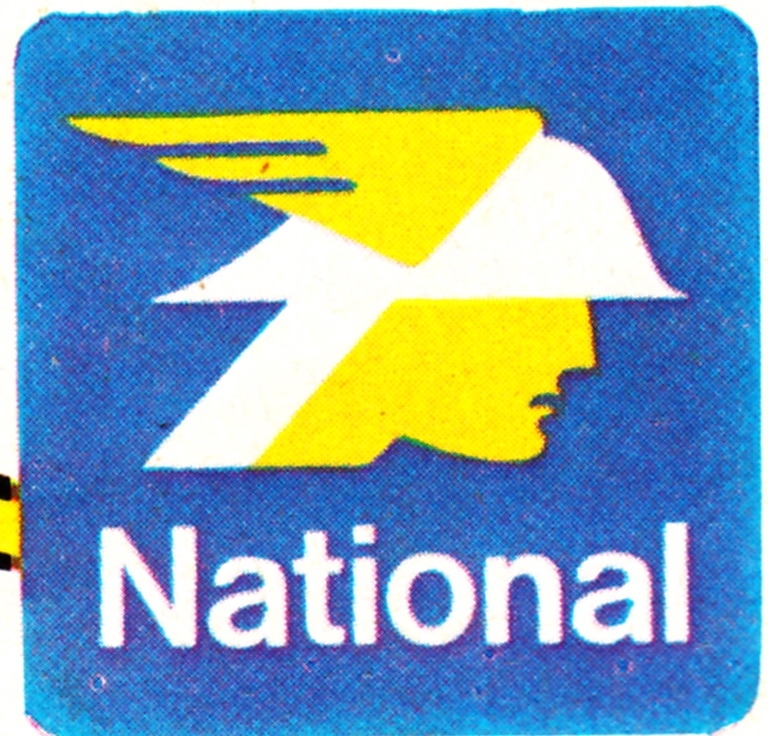 A quick bit of Wikipedia finger-work reveals that the chain, actually owned by BP since 1957, was phased-out through the eighties in favour of the stronger BP brand. 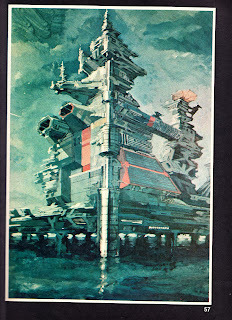 Individual stations were, presumably, refitted to operate under the BP facia. 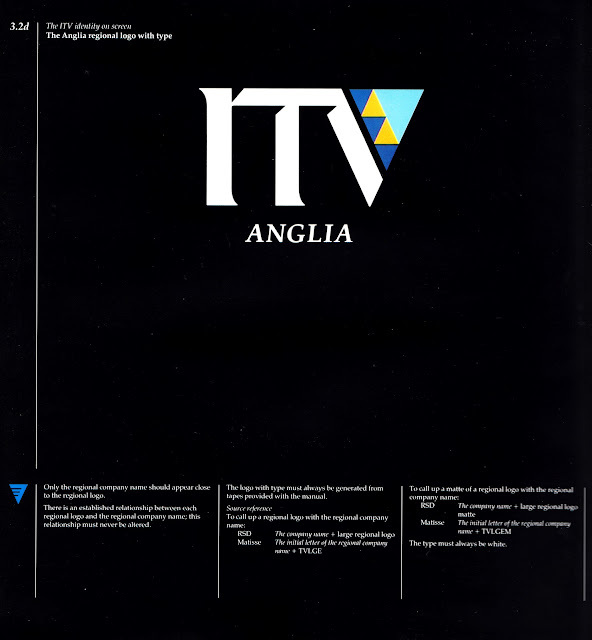 It wasn't the end of the Smurfs however: the animated series (shown randomly on ITV in the UK: LWT, for example, used it as a Sunday afternoon schedule filler) led to fresh waves of merchandising and the figurines themselves were sold in other outlets including gift and card emporiums. 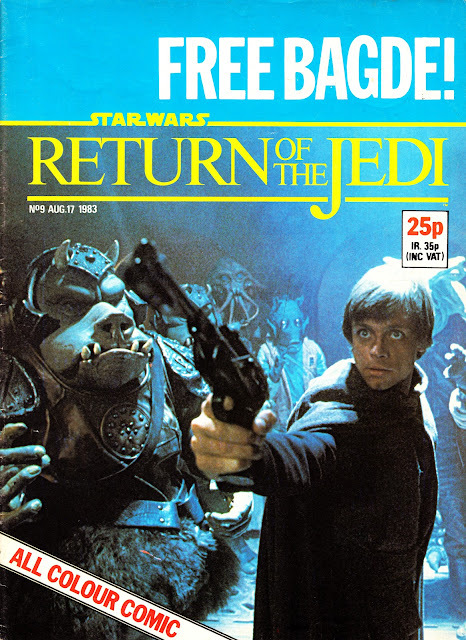 Spot C.Y.R.I.L's - ahem - deliberate mistake on the cover of Marvel UK's RETURN OF THE JEDI weekly issue 9! The cover-mounted gift itself was a "May The Force Be With You!" 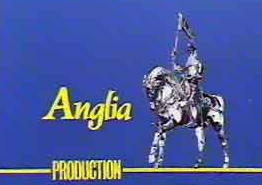 pin badge, tapped to each copy top-left. It's long-since vanished from this particular copy. The lure of the badge, and Marvel's sometimes erratic distribution, meant I couldn't actually find a copy of this issue when it was published and only tracked-down this sans-gift copy many years later. 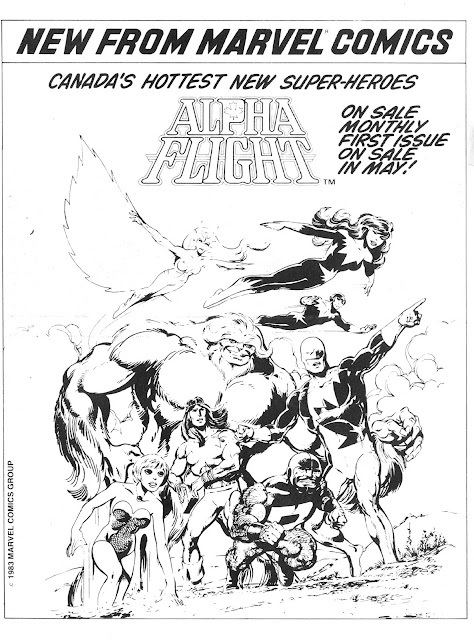 The photo-covers were a canny ploy by Marvel to attract casual readers and continued for quite some time... basically until the stock of suitable images were well-and-truly exhausted (some looked a little desperate although Star Warriors didn't care). 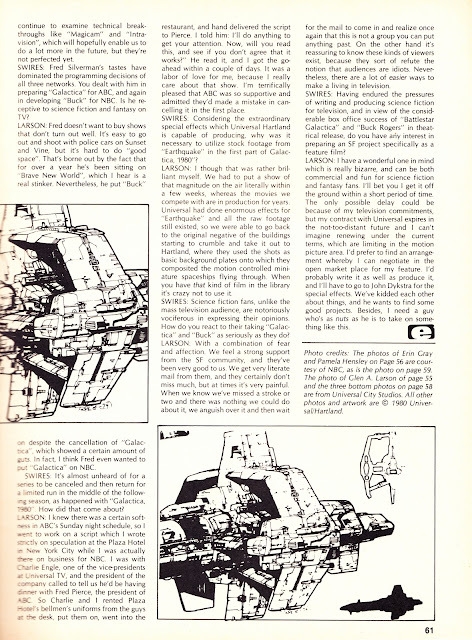 Dez Skinn had first introduced photo-covers to STAR WARS WEEKLY when he took the Marvel UK helm in 1979, although they never fully replaced artwork covers as a regular fixture. 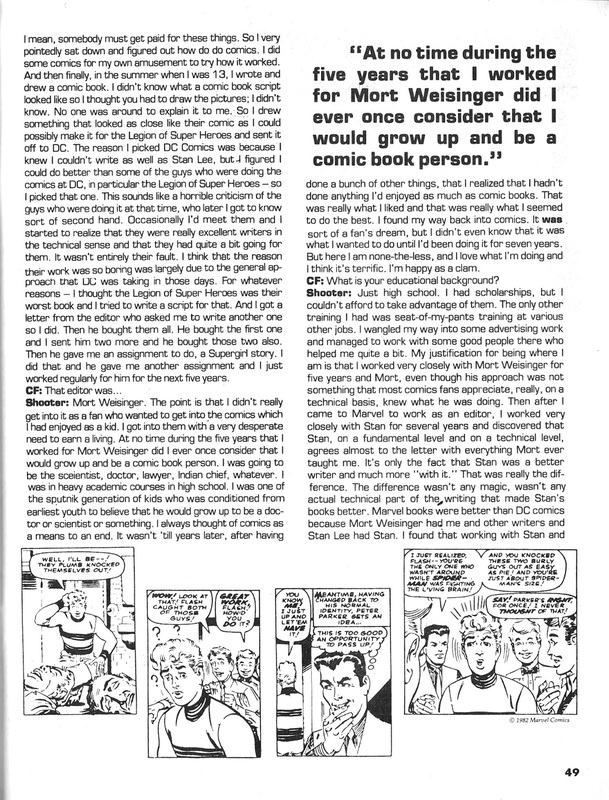 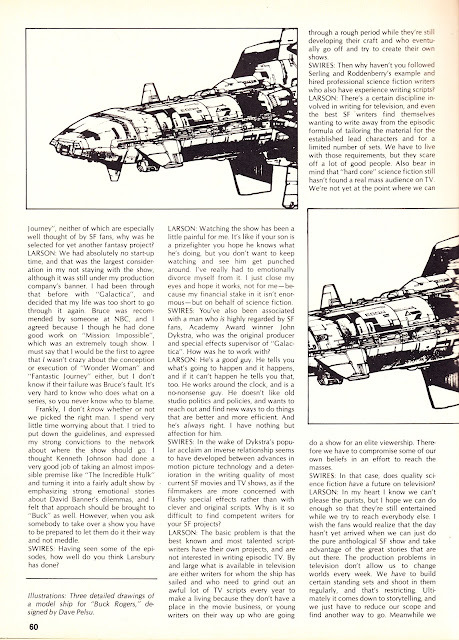 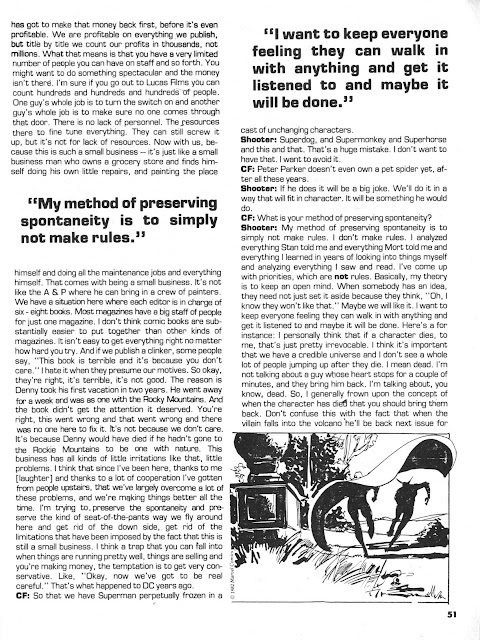 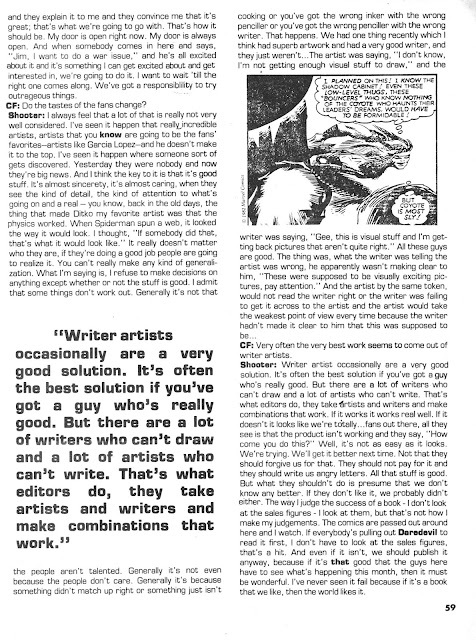 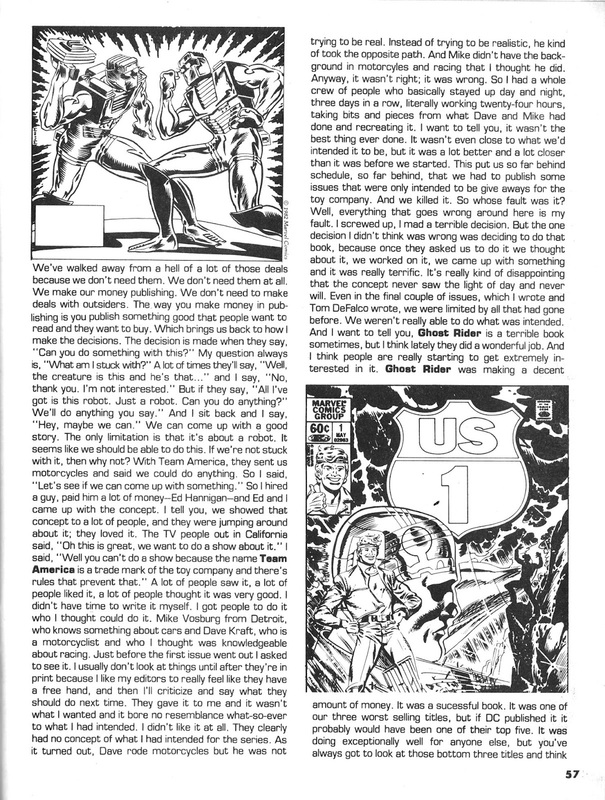 Here's a really nice interview with Glen Larson (conducted by Steve Swires), published in Marvel's EPIC ILLUSTRATED magazine (issue 2, summer 1980), where he discusses BATTLESTAR GALACTICA, BUCK ROGERS IN THE 25th CENTURY and GALACTICA 1980. Amongst the points discussed: How Larson became involved with Buck Rogers; how it morphed from a TV project into a feature film... and back into a TV series and how he went undercover to pitch Galactica 1980* to ABC. 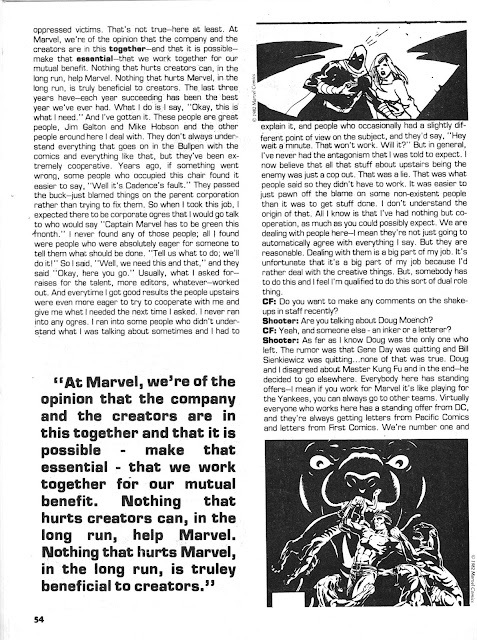 He also, surprisingly, touches upon the upcoming contract negotiations which would - eventually - see him part company with Universal in favour of a new deal at 20th Century Fox. 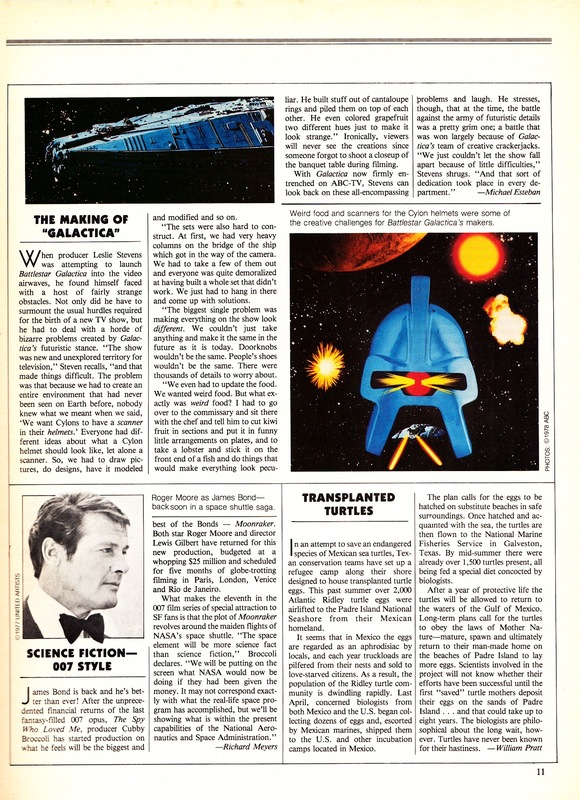 The interview, presumably conducted early in 1980 (Swires has seen footage from Galactica 1980's Galactica Discovers Earth but doesn't discuss the show in detail), doesn't make any reference to G80 becoming a weekly series. 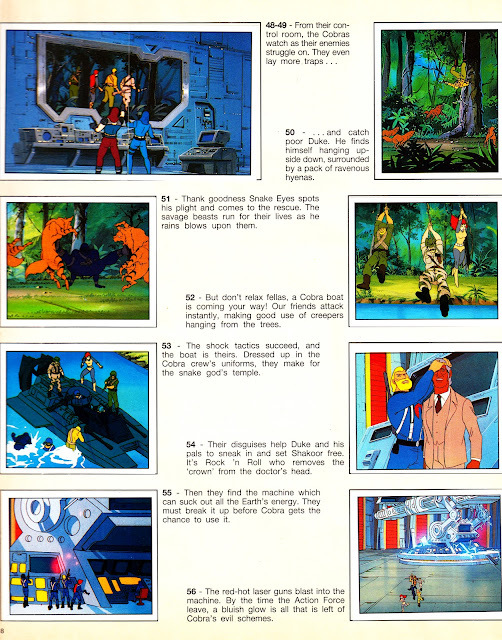 It also includes some very nice Buck Rogers production art not seen elsewhere. * A subterfuge which seems to contradict claims in later interviews that it was ABC that wanted to go ahead with the revival. 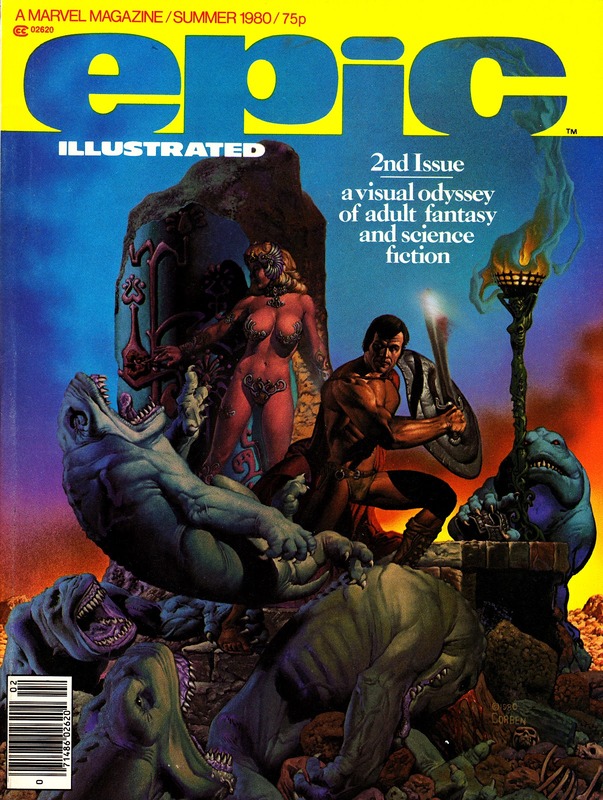 EPIC ILLUSTRATED, a magazine very much in the HEAVY METAL tradition, was a forerunner to the entire Epic Comics creator-owned line. 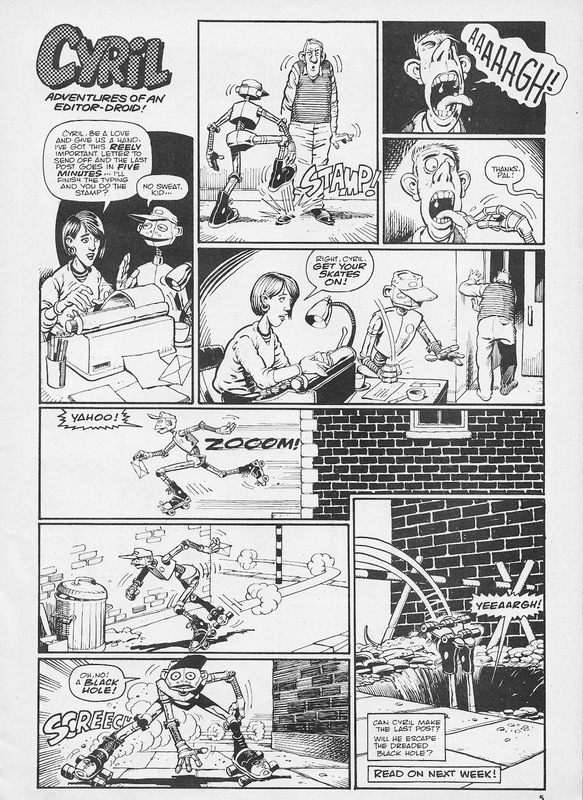 It mixed a variety of comic strips with the occasional text feature. 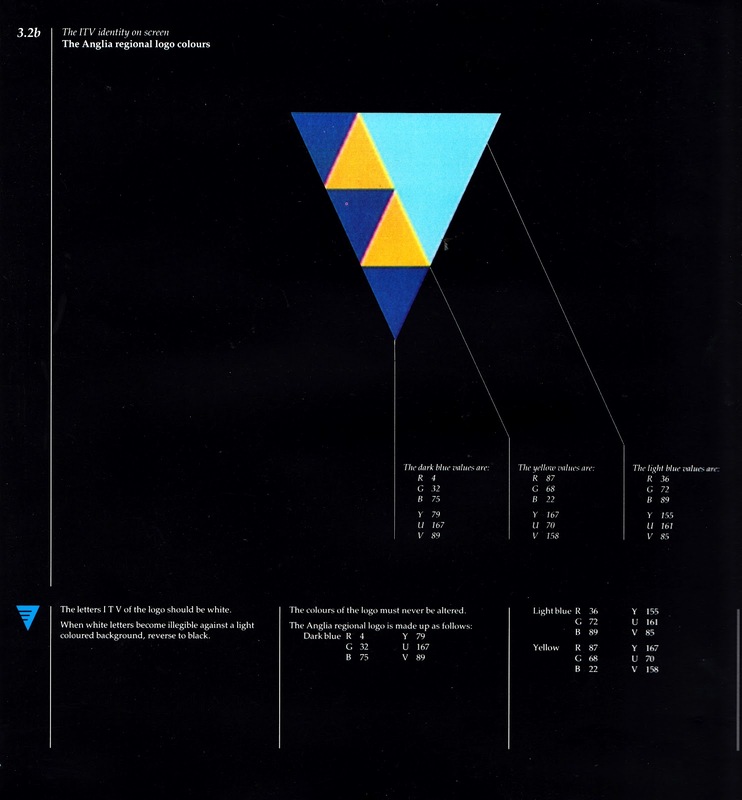 It ran for 34 issues, folding in February 1986. 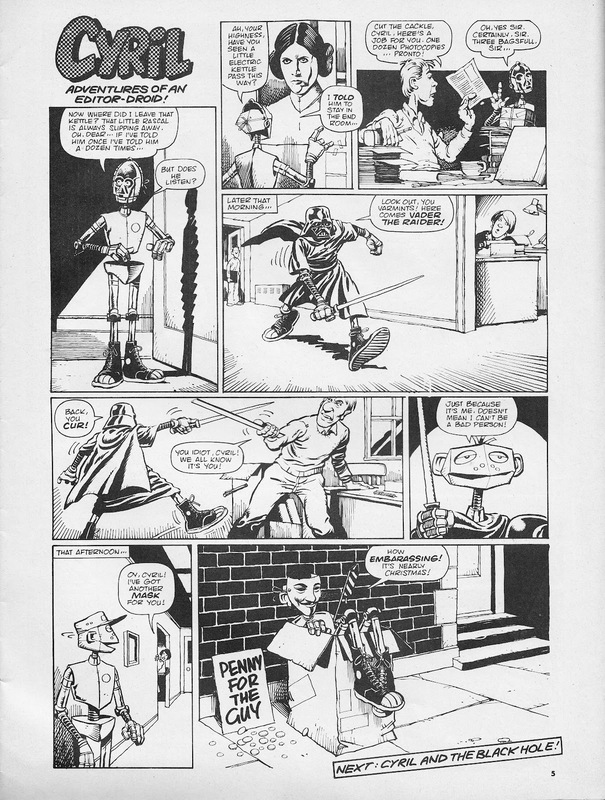 Here's the third instalment of Marvel UK's ongoing C.Y.R.I.L one-page humour strip, from the pages of RETURN OF THE JEDI weekly. 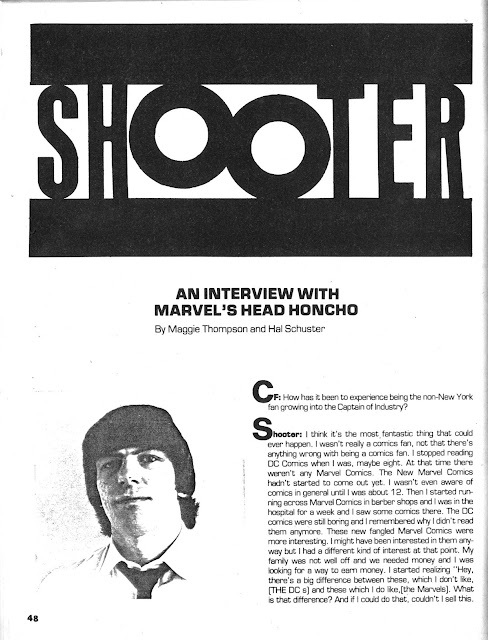 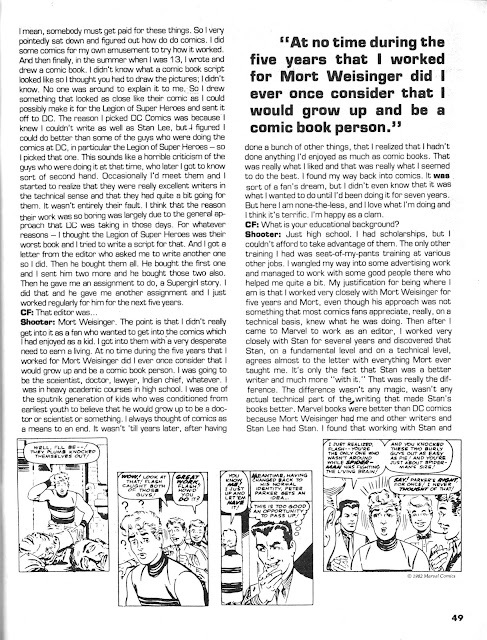 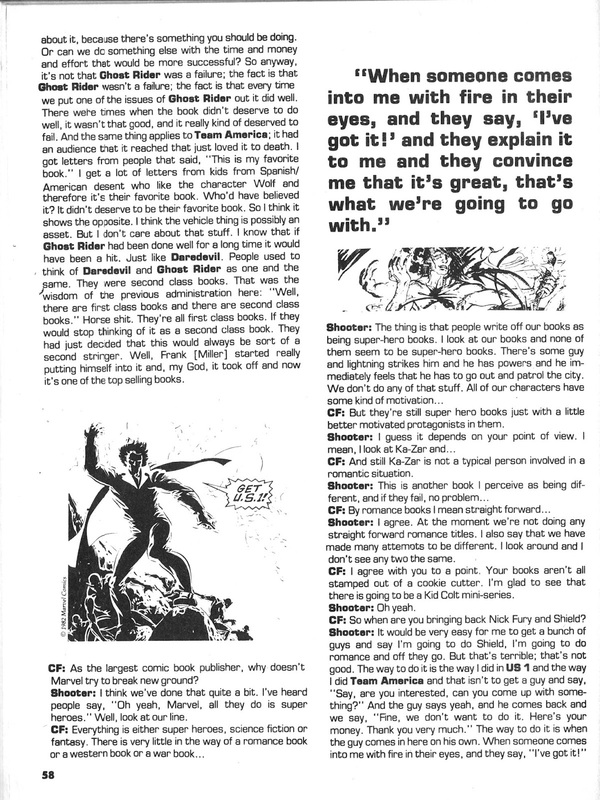 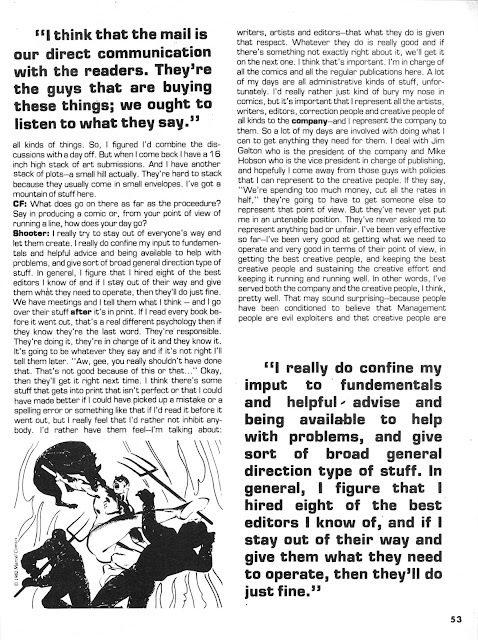 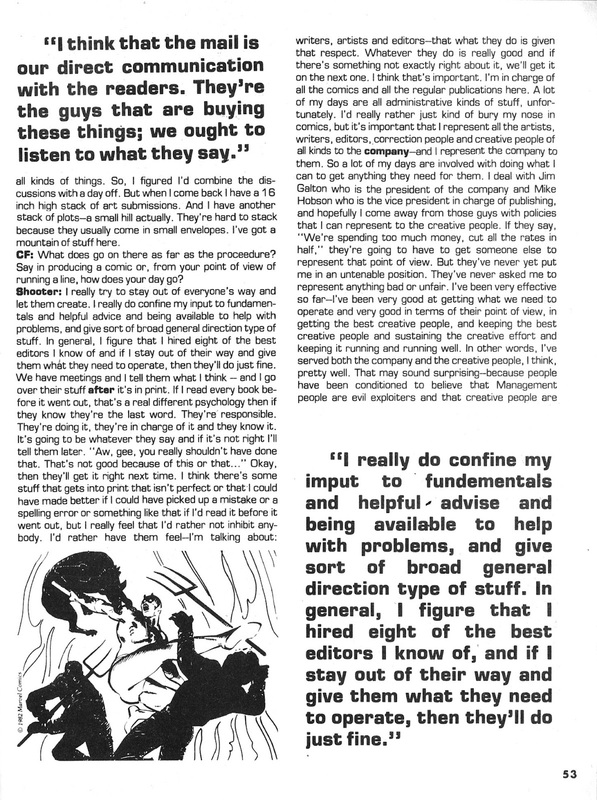 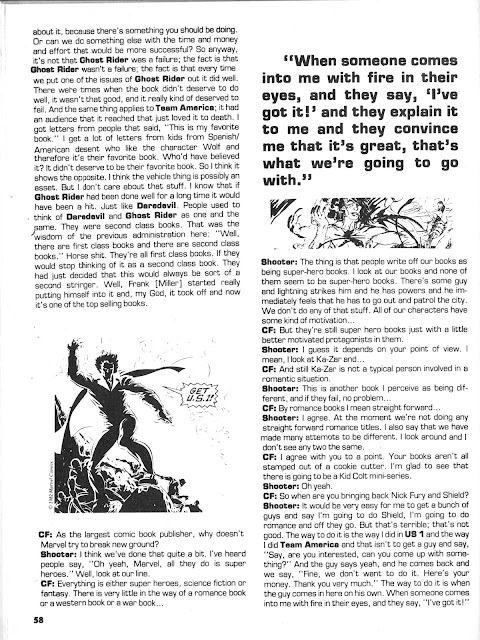 Here's a vintage COMICS FEATURE interview with Marvel's controversial guvnor "Jolly" Jim Shooter from 1983 (issue 23/24).